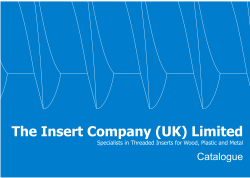 The Insert Company (UK) Limited is based in the West Midlands, has been established since 2003 and has supplied thousands of customers worldwide. Our extensive experience within the fastenings industry means that we are able to supply any part at a competitive price. We can also have parts specially made for your application, including turned metal parts, metal presswork and plating. Office Hours 9-4.30 Mon-Thurs, 9-1 Fri.